This is so easy and as good tasting as it is easy. It is important, though, that you make it with young asparagus, picked when the stalks are thin like a pencil and not as big as your fingers in circumference. I heated 1 tbsp of olive oil in a skillet while I cleaned and trimmed the ends off the asparagus. I used 10 pieces of asparagus because I was very hungry. I put the asparagus in the oil to cook for about 3-4 minutes and then turned them spears. I cracked 3 eggs on top, added a few small pieces of cheese, some salt and pepper and covered so the eggs would cook with some steam. After a couple minutes, I took off the lid and served it all up on a plate. 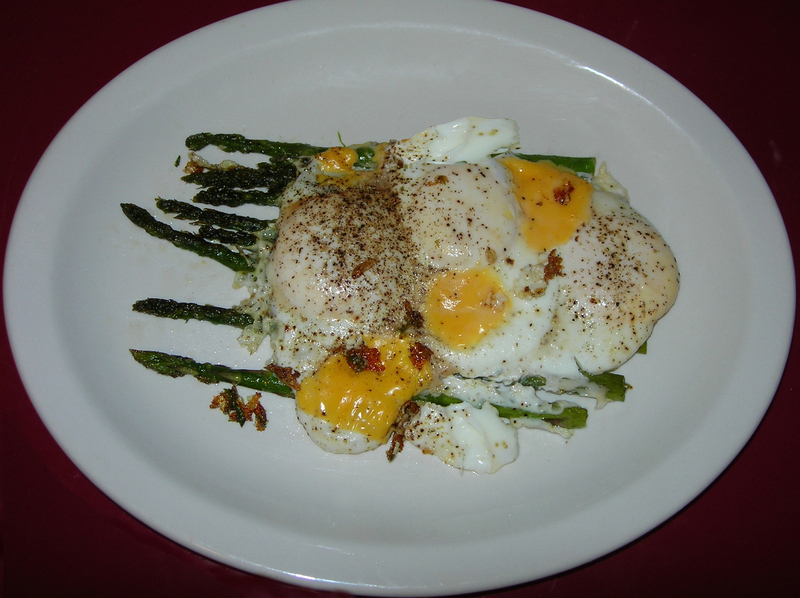 The asparagus was tender and the eggs were a perfect complement. The bits of cheese added just a bit of rich creaminess to a bite. It was a delicious meal for an early lunch. These were tasty when warm, but cold the next day they were so much, much better. They are very flavorful so just a couple satisfies your taste buds and make a good snack between meals. First clean about a pound of brussels sprouts and cut off the stems. 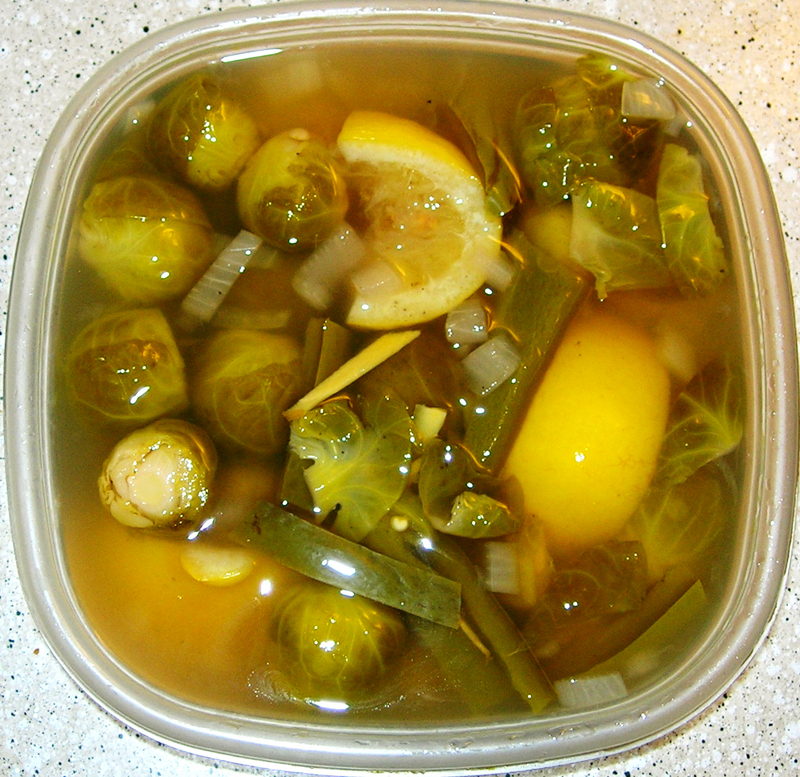 Put in a cooking pot with a liquid that is 1/2 white wine vinegar and 1/2 water – just enough to cover the sprouts. Add 1 thumb of ginger roots sliced into small toothpick size sticks, 1 jalapeño cut into strips about thumb length, add 1/2 of a yellow onion. I diced them, but next time I will cut into sections so they can be picked up with your finger or a toothpick. I cut a lemon into 1/4s and tossed it in. I added about 1/4 cup of sugar and salt and pepper and brought it to a boil. I let it continue to simmer until he sprouts were tender. After it cooled, I poured into a storage container and let chill. It’s spicy with great heat and flavor but not the least bit uncomfortably hot. The lemon and vinegar make is nice and tart for a fabulous sweet, sour and hot blend. This was a quick dish I threw together for lunch. I chopped up about 2 TBSP of yellow onions and sautéed them in 1 TBSP of olive oil. I added some salt and pepper. 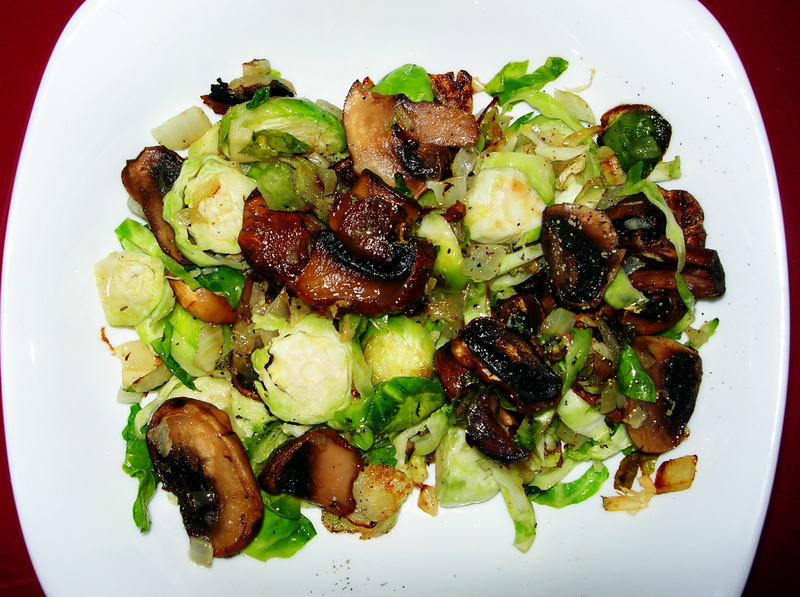 While the sautéed, I slice 4 mushrooms and added them and let them cook while I cleaned and sliced 8 brussels sprouts. I then added them to the pan, tossed in a little more salt and pepper and one diced clove of garlic and continued to cook, tossing lightly. When the veggies were tender, I squeezed the juice of 1/3 of a fresh lemon on top, tossed again before turning them into a bowl for lunch. The mushrooms add a bit of earthiness and is there anything tastier than some lemon and garlic in oil on delicious fresh vegetables? 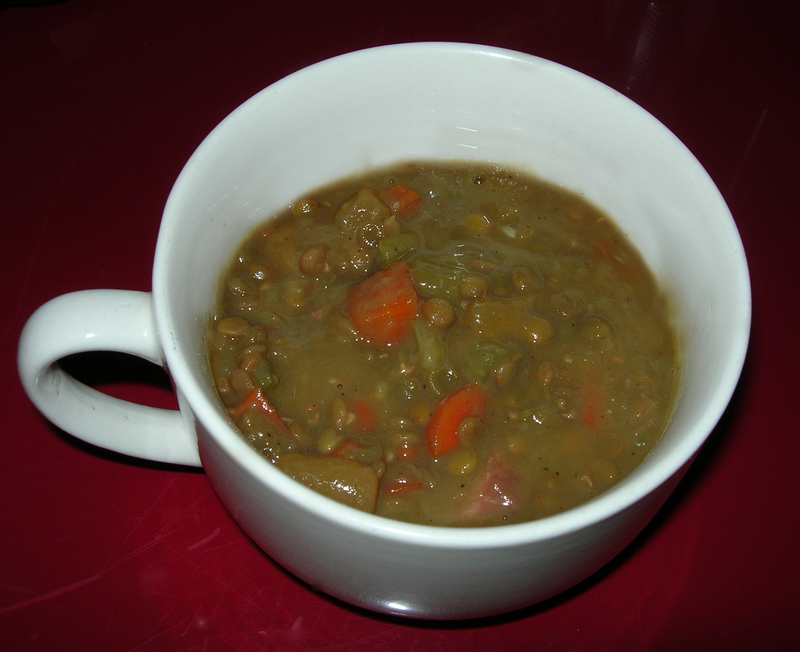 I love a good lentil soup and make it frequently. I usually use a ham shank to add some depth to the flavor of the broth, but vegans can leave the ham shank out and make it vegan. It will still taste good. This batch, though, was the best ever thanks to the idea of adding a couple rutabaga. Heat 1.5 TBSP of olive oil in your stew pot. Add some pepper and cumin to heat and infuse the oil. Add 1 large yellow onion, chopped and let soften. Then add 3 chopped carrots and 3 chopped celery and 4 diced garlic and saute. Peel and chop two rutabaga and add, let all of this cook a bit. This is when us carnivores can add the ham shank. Add a couple quarts of water and let simmer until veggies are tender. Add one pound of lentils and cook until tender. This is a rich and hearty soup and the rutabaga adds a tartness that is just incredible. It makes a huge pot of soup – about 8 to 10 bowls similar to the one in the picture.